« Fashionista NOW: How To Wear The Mesh Fashion Trend? 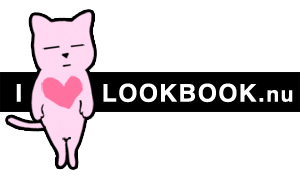 Definitely not your usual baju kurung. Take a peep at how Syomirizwa Gupta new collection of baju kurung modern and have it transformed the way you view BAJU RAYA this season! 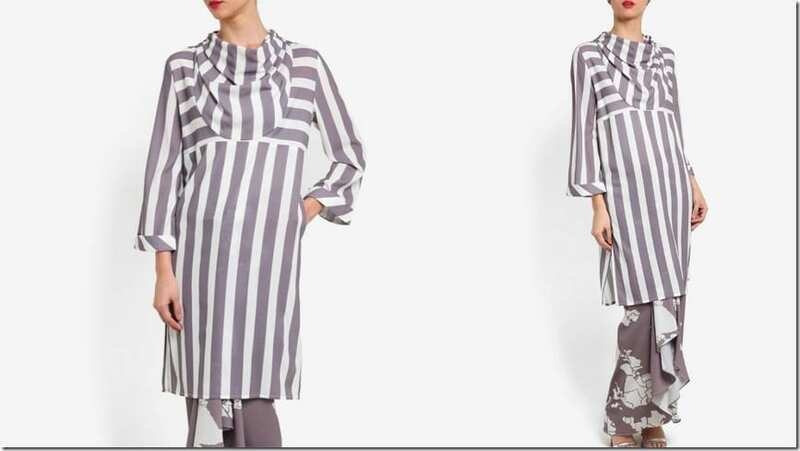 It’s one thing to see a collection of baju kurung that plays on the popular elements much loved by the current fashion wave like bell sleeves, peplums and tops with asymmetric hemlines and a muted color scheme that leans on the minimalistic edge and be impressed as it speaks to the crowd’s favorite. And another experience totally with Syomirizwa Gupta’s 2017 collection that throws your expectations out of the window and that is my state of mind the second my eyeballs detected the existence of the Malaysian fashion designer modern baju kurung and long dresses available on ZALORA Malaysia. I had to pause for a longer time to take in all the delightful details of the nautical-inspired kurung and dress sets to come to the right words over this out-of-the-box Raya 2017 collection. 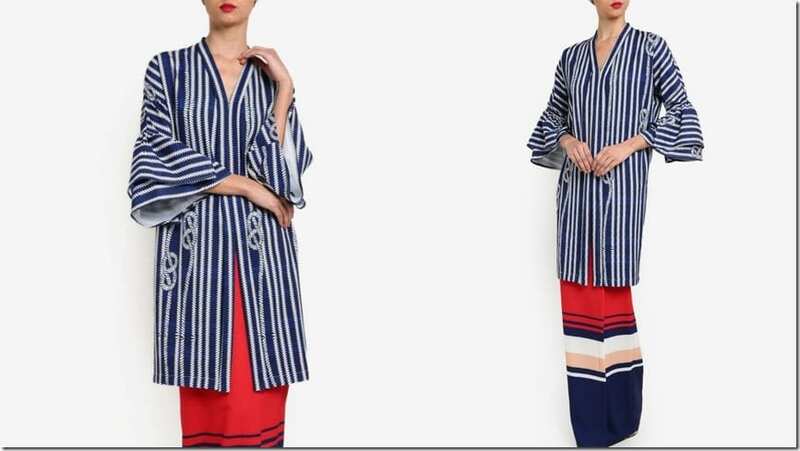 What I can say is that the brilliant use of nautical-inspired print – pinstripes, stripes of various width and arrangements, along with the unexpected mandarin collar and cowl necklines, bow tie waist, puff sleeve statement, and long tops that go over long skirts in nautical-inspired colors of navy, red and white and grey – all work miraculously (with the guide of the artistic hand of the fashion maestro) to produce a mind-blowing Raya-worthy collection that embodies luxe retro cruise flair whilst elevating the traditional baju kurung appeal to the next level. I am beyond impressed by this designer collection for Raya 2017 and I am certain that I am not the only one. 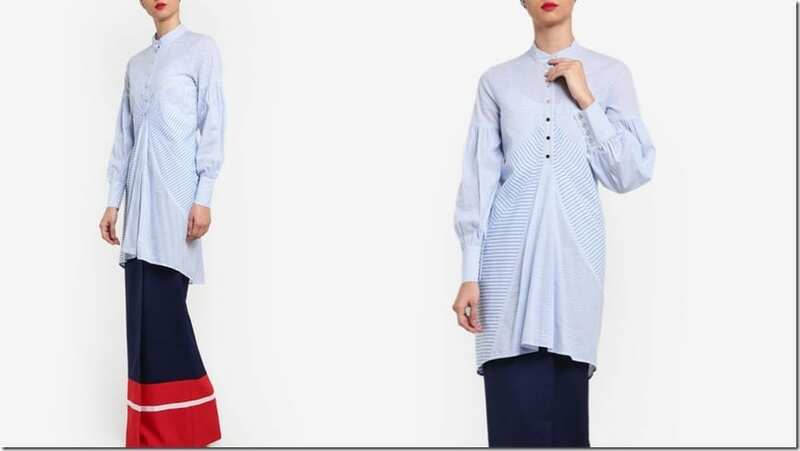 Look below to see the stunning creations of mod baju kurung that is brimming with nautical touches! Enjoy! Which baju kurung would you love to wear? Share below – I’d love to know!